Study identifies gene responsible for regeneration of injured muscle by adult stem cells. It is known that skeletal muscle regeneration is impaired in age-related diseases such as sarcopenia, which is marked by reduced muscle regenerative capacity with aging, due in part to a reduction in muscle stem cells or satellite cells. This is also the case with adult late-onset myopathies, including limb girdle muscular dystrophy. However, it is unclear how this loss of satellite cells occurs. Now, a study from researchers at researchers at NYU Langone Medical Center and the University of Colorado at Boulder shows that a key gene enables the repair of injured muscle throughout life. The team state that their findings suggest this overlooked gene may play an important role in sarcopenia. The opensource study is published in the journal Cell Reports. Previous studies show that the instructions encoded in DNA chains for the building of proteins are carried by intermediates known as messenger RNAs (mRNAs). Proteins comprise the body’s structures, enzymes and signals, including muscle. The expression of certain genes that need to be turned on and off quickly is controlled in part by the targeted destruction of their mRNA intermediates, a job assigned to proteins like AUF1. Changes in the action of AUF1 have also been linked by past studies to human muscle diseases. The current study shows that levels of AUF1 determine whether pools of stem cells retain the ability to regenerate muscle after injury and as mice age. The current study utilised mice engineered to lack the AUF1 gene, which exhibited increased MMP9 activity and reduced stem-cell-driven repair. Results show that this self-sabotages the stem cell pools that normally repair muscle, and destroys the niche in which their muscle stem cells reside as they await activation. Data findings show that together, this results in a dramatic and continuous breakdown of skeletal muscle. The lab explain that following skeletal muscle injury, muscle stem cells receive a signal to multiply and repair damaged tissue, a process that they show is controlled by AUF1. They observed that among the mRNA targets of AUF1 in muscle stem cells, is one that encodes a ‘master regulator’ of adult muscle regeneration, a protein known as MMP9. Results show that normal muscle stem cell function and related muscle regeneration in mice lacking AUF1 can be restored, by repurposing a drug developed for cancer treatment that blocks MMP9 activity. The team surmise that their work places the origin of certain muscle diseases squarely within muscle stem cells, and shows that AUF1 is a vital controller of adult muscle stem cell fate. They go on to add that results suggest AUF1 has evolved to be a key regulator of stem cell fate and the related regenerative ability of adult tissues. For the future, the researchers state that this provides a potential path to clinical treatments that accelerate muscle regeneration following traumatic injury, or in patients with certain types of adult onset muscular dystrophy. They conclude that the global medical community may be able to treat a variety of degenerative diseases by enhancing stem cells through targeting MMP9 and its pathways, even those with normal AUF1. 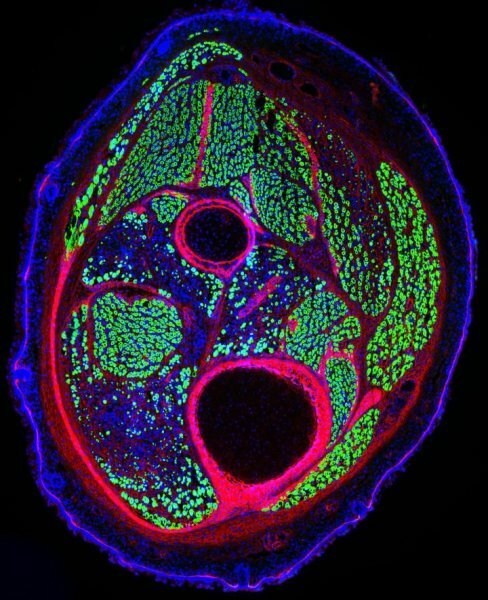 Muscle stem cells both generate new muscle (shown here in green) and regenerate it after damage. Credit: Laboratory of Alessandra Sacco.